edges of the lips are still joined together, and it is still constantly attached to the teat, sucking small amounts of milk at frequent intervals. In the next two months the small pouch young doubles its length, while its weight increases to about 150 grams (see Plate 15). 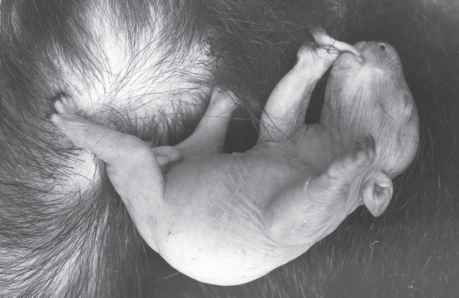 Facial structures -eyelids, nostrils and so on - are developing and the ears are fully unfolded. Whiskers are beginning to appear beside its mouth and on the cheeks and eyebrows, but it still has no other sign of hair for another two to three weeks, when very fine fur appears on its ears. The skin is still pink and wrinkled in some places (see Figure 6.2 and Plate 16). the time the fine fur is developing, it has expanded for up to 12 centimetres in any or all directions from the mid-point of the opening. 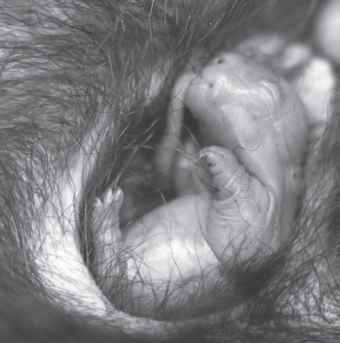 Usually, the pouch expands more anteriorly - towards the mother's chest - than in the other directions. 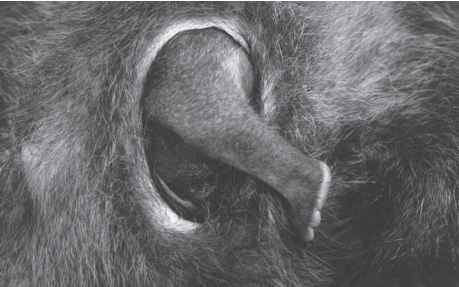 Very fine fur, only one to two millimetres long, covers much of the young wombat's body by six months of age, and now it is ready to take its first look at the world - or what it can see of it from the opening of the pouch. A pink nose or forepaw, or occasionally a whole back leg, can sometimes be seen poking out of the pouch (Figure 6.3); but to look out the young wombat either lies on its front with its front paws tucked in and its head framed in the opening (see Plate 17), or it sits hunched over, so that its head and all four feet are near the pouch opening (Figure 6.4). The young wombat's upper and lower first molars are usually present by the time it is six months old, and the lower incisors are about three or four millimetres long. The upper incisors also erupt about this time. Occasionally, while the mother is feeding, the young in the pouch will bite at a blade of grass or extend a small forepaw, grasp a blade and pull it towards its mouth. It probably does not eat it at this stage, but it makes its first investigation of grass in this way. No actual observations of the mother cleaning the young in the pouch, or attending to it in any way, have been recorded. 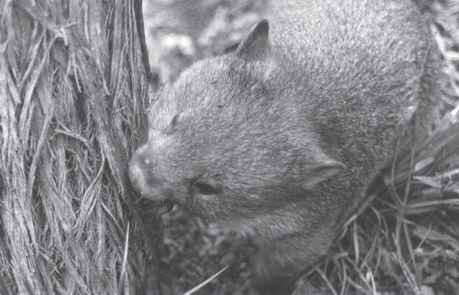 It is not known how the young wombat copes with its waste products, but it seems likely that the mother licks the cloaca of the young when it is very small, to remove urine and faeces in the same way as a kangaroo mother does, although it is anatomically much more difficult for a wombat to reach its head into the pouch. 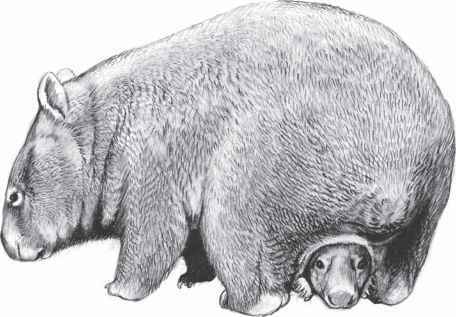 By the time the young is detached from the teat it is about 15 centimetres long, and it would be almost impossible for her to reach over and into the pouch entrance. Young, fine-furred pouch young have been seen to push the tail section out of the pouch and pass urine and small faecal pellets.